A report released last month claimed that the deal Google made with HTC for the latter to build the Pixel and Pixel XL was good for two years. That would mean that we should expect the Pixel 2 and Pixel XL 2 to both be built by HTC. But last week there was another report that said Google would scrap the Pixel XL 2. Instead, it would offer a larger screened phablet made by LG, with an Aspect Ratio of 18:9. At the least, HTC would still be the company behind the Pixel 2. But out of Japan today came something completely different. A bit of news stated that inside the system files of the HTC U11 flagship phone, are references made about the new Pixel sequels. Just as the Pixel and Pixel XL were known by their code names of S1 and M1 respectively, the system files make note of the S2 and the M2. There could be a simple reason for the M2 showing up in the system files, even if the phone was reported to be cancelled as recently as one week ago. The listing could be old and the reference placed way before the Pixel XL 2 was supposedly 86'd by Google. That certainly could happen, and would explain everything. If that is the case, we can expect the Pixel 2 to be built by HTC, and a larger sized Pixel phablet produced by LG. We don't want to leave out one other possibility, which is the one where the LG built Pixel phablet is not real and for 2017 we will see the originally expected Pixel 2 and Pixel XL 2 (S2 and M2, respectively), both built by HTC. What it all means, we will know in the days and weeks ahead. Surely there will be more leaks pertaining to the Pixel sequels. Keep checking in for the latest, and don't call me Shirley. Well I hope we get a 18:9 pixel with minimal bezels. A pixel version of the G6 with a better pixel camera and stock android. Throw in the wide angle camera too and it would be a killer phone. I'd buy it for sure!! Oh please. Stop adoring these ridiculous screen ratio's! Any other time you would complain about black borders, bezels and god-know-what. And now you want a phone with a screen ratio that isn't been used by the majority of apps. If you gonna use the bottom to display the standard android buttons permanently then you could as well stick to a 16/9 screen and use the bottom bezel for capacitive or real buttons. The main reason why 2:1 isn't been used by the majority of apps is because it is rather new and needs time to establish itself. I bet in 2-3 years it will be the standard for (highend) Android devices! Let's hope Pixel 2 will be similar to G6! That's exactly what I am hoping for also. I could take or leave the screen ratio but minimal bezels like the G6 would be fantastic. Another stupid comment and lack of rationality from dumbass ibend. I will be disappointed if it releases yet again with the oversized bezels and if they continue to have supply issues. 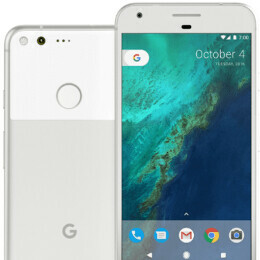 I'm in the market for a new phone and I'm leaning towards the Pixel 2. That's cool. I'm not looking for a monster sized phone, something small that doesn't compromise on the specs and I'll be happy. Outside the nerd comnunity, no one has even heard of pixel,who cares. Your statement is false, I actually see pixels quite a bit. A hell of alot more thdn I have ever seen nexus phones. I see atleast one daily now a days. That comment wasn't a typo. Google capitalized on HTC struggling. They were probably glad to gain business and bid low. Say no to stupid maple_mak. Made by HTC only makes shortage, limited availability and expensive price. Only hope that LG or other OEM (except Huawei) can manufacture the Pixel. I know that you're Pixel fanboy and I'm really interested in new Pixel series. But please, this is a truth. Wonder how many hardware and software defects we can expect this time? For some reason Google just can't get a handle on its own phones. They should have kept Motorola. Would have been a different market today with a whole line up of matured inhouse Google built phones. Google was facing immense backlash from Samsung, HTC, Sony and LG because of Motorola. You have to understand, Moto X got KK before Nexus 4 when it was launched on Nexus 5. Then the Moto X² received Lollipop before Nexus 5. The other OEMs were threatening to switch platforms (Microsoft wasn't as dead). Wow that's crazy, I had no idea the OEM's were fighting back, but it makes me wish they'd kept Motorola even more and told the OEM's to get their act together or get lost. The OEM's, even if they did leave, world have come running back and Google could have asserted restrictions for software updates etc. Man what could have been. God I hope it's not HTC again. It will save me money though. It's easy: HTC will make the smaller one (cheaper and with regular ugly bezels), LG will build the larger one which will also sport very small bezels. And the LG G7 will be based on Pixel 2 XL. The last Nexus LG built was terrible, between by wife and sister in law they went through 5 of them, wound up replacing with a pixel. I had two Verizon LG phones years ago that were terrible. Two people I know have expensive LG televisions that were terrible and then replaced with Samsung's. Two friends had the G4's which lost all there pictures due to memory issues (they didn't back up, there loss). I don't know why LG excites people, anything they make I stay far away from.